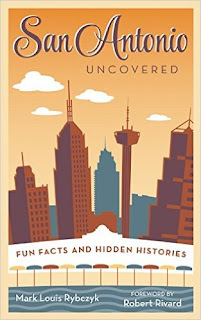 Author's Note: Readers of The Travis Club have asked my about numerous San Antonio historical references in the book, usually presented as short excerpt's from the main characters quirky writings. Readers have written me asking what is really true? For the most part, all the historical excerpts are true, with some minor changes to help advance the book's plot. 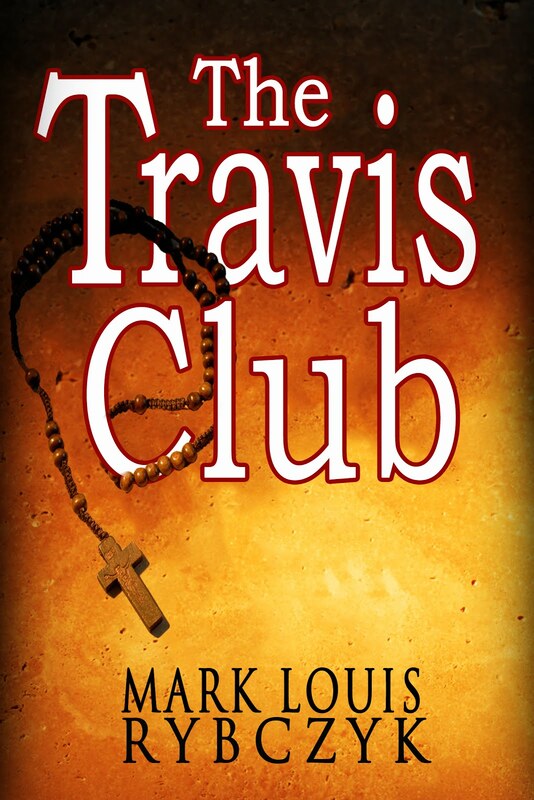 In my book, The Travis Club, I tell the story of a young writer who discovers that the contents of Davy Crockett's tomb in San Antonio's oldest cathedral are not what they seem. He quickly realizes, there will be consequences for his discovery. One of the most often frequent questions I'm asked, "Is Davy Crockett's tomb really in the back of San Fernando Cathedral?" Yes, there is a tomb in the back of San Fernando Cathedral. 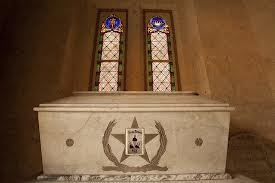 And the tomb does state that it is the final resting place of Davy Crockett, William B. Travis, Jim Bowie and the other defenders of the Alamo. But there is more to the story than meets the eye. 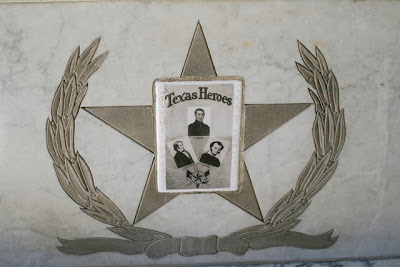 The outside of the tomb has photos of Travis, Crockett and Bowie. This stone lays adjacent to the tomb. 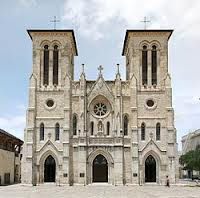 First we must point out that San Fernando Cathedral opened in 1728, 48 years before the birth of the United States and over 100 years before the Battle of the Alamo. But you may have noticed on the stone above, that the bodies were laid to rest in 1938, 100 years after the battle. That is our first clue that something is amiss. The controversy about the tomb starts in 1888, when Colonel Juan Segiun wrote a letter stating that he took the remains of the Alamo defenders and buried them beneath the altar at the cathedral. Most people dismissed the letter until nearly 50 years later, when on July 28 1936, workmen digging a foundation for a new altar, discovered charred human remains. Excitement in San Antonio grew as church officials realized the importance of their discovery. The remains were exhumed with a variety of witnesses on hand, including writer Frederick C. Chabot, Mayor C. K. Quinn, Postmaster D. J. Quill, Adina DeZavala, daughter of Lorenzo DeZavala and Mrs. Leita Small, caretaker of the Alamo. The remains were placed on public display for a year, then entombed on May 11, 1938. To quell rumors surrounding the findings, the diocese published a now rare book entitled The Truth About The Burial of the Remains of the Alamo Heroes. 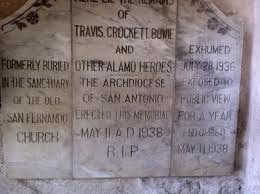 Most historians doubt that the remains of Crockett, Travis, Bowie are buried in the tomb. First of all, Santa Anna ordered the cremation of all bodies left at the Alamo. Most likely Mexican and Texan soldiers were burned and buried together. Secondly, Seguin did not return to the Alamo until after the Battle of San Jacinto, almost a month later. There is an argument that the remains are those of Alamo defenders, but it would be a bit presumptuous to assume they are the actual remains of Davy Crockett. 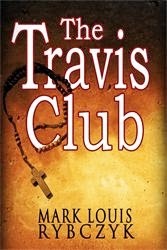 In my fictional work, The Travis Club, a young writer discovers for the first time, the real story behind the tomb and the consequences behind his discovery. "This detailed book is at once a tourist's friend and a native's reference. Rybczyk says it was written for the curious native (whatever that is) and secondly for the newly arrived who may wonder "What's so special about San Antonio?" Notice who it was written for first. Every landmark, legend and myth of San Antonio is here - from the ugliest statue to the histories of the railroad stations. It's a smorgasbord of overlooked and under-appreciated jewels from all over the city. The obligatory shrines and sites are here too - every one of them. Throughout the book's pages Mark employs the rarest type of humor - humor with genuine affection. Mark corrects the old saw that said San Antonio is "a small town wanting to be a big city." It is, as he says, "A big town that desperately wants to be a small town." With this book as your guide, it's almost as though San Antonio gets its wish." "What a surprise! . . .a page-turner . . . extremely well-written and well researched. . . I highly recommend this book to all mystery lovers . . . a great read. . . couldn't wait to find out what would happen next . . . I love a book you can't put down, and this certainly fit the bill . . . very engaging . . . I really couldn't stop reading it . . . a fantastic and completely believable story"